People worship Goddess Saraswati to get enlighten with knowledge and to get rid of lethargy, sluggishness and ignorance. This ritual of initiating education to children is known as Akshar-Abhyasam or Vidya-Arambham/Praasana which is one of the famous rituals of Vasant Panchami. Schools and colleges arrange pujas in the morning to seek blessing of the Goddess. Purvahna Kala, which is the time between the sunrise and the midday, is considered to decide Vasant Panchami day. Vasant Panchami is celebrated on the day when Panchami Tithi prevails during Purvahna Kala. Due to which Vasant Panchami might also fall on Chaturthi Tithi. Many astrologers consider Vasant Panchami as Abujha (अबूझ) day which is auspicious to start all good work. 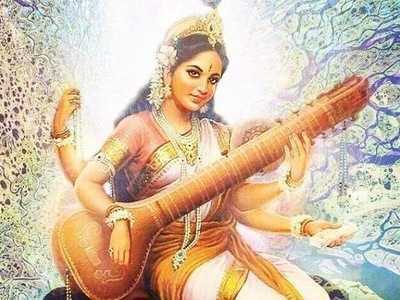 According to this belief whole Vasant Panchami day is auspicious to perform Saraswati Puja. Although there is no special time to perform Saraswati Puja on Vasant Panchami day one should make sure that Puja is done when Panchami Tithi is prevailing. Many times Panchami Tithi doesn't prevail whole of the day on Vasant Panchami day hence we believe that it is important to do Saraswati puja within Panchami Tithi. Saraswati Puja time during Purvahna Kala while Panchami Tithi is prevailing. Purvahna Kala falls between the sunrise and the midday which is also the time when most people perform Saraswati Puja including schools and colleges in India. Saraswati Ya Kundendu is the most famous Stuti dedicated to Goddess Saraswati and part of the famous Saraswati Stotram. It is recited during Saraswati Puja on the eve of Vasant Panchami.